Last night for New Year's Eve I didn't even make it to midnight. I fell asleep at 10:30. I did attempt to make it to the New Year by drinking coffee, but even that couldn't keep me awake. My kids fell asleep at 9, so I did slightly better for them. Today I made black-eyed peas for good luck and my husband and I enjoyed the champagne that we never drank last night. I tried a new way of preparing my black-eyed peas and they were delicious. While I might not of stayed up to ring in the New Year, I do have traditions that I try to keep. One of them is to make a delicious dessert for New Year's Eve. There is something comforting about saying goodbye to another year with something comforting and sweet. Earlier in the day I made a new Chocolate Pudding recipe from the January 2013 issue of All You magazine to help celebrate the New Year. This recipe has 6 ingredients. It takes 20 minutes of total time, all of which is active and makes 8 servings. I had no problems finding any of the ingredients at my local grocery store. I allowed the pudding to fully chill before serving and I served the pudding in canning jars. The look of drinks and desserts in small canning jars is great and looks unique. I did find that the recipe only made three servings, instead of the 8 suggested by the recipe and magazine photo. I followed the remainder of the recipe as written. I thought this pudding was delicious. It wasn't overly sweet, but instead was rich and full of chocolate flavor. My two boys loved the pudding and the homemade whipped cream I served on top. I think if I made the recipe again I would double it, since my family eats large servings and it only made three. This is definitely a recipe I would make again in the future. For the recipe go to Chocolate Pudding. 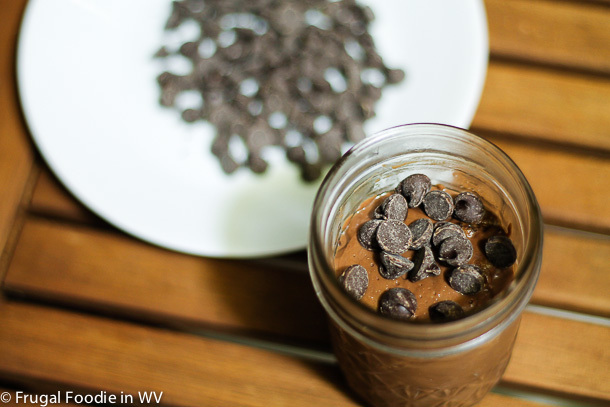 I am going to make this chocolate pudding today ! Thanks for reminding me :-D Have a great new year ! Great post! Thanks for joining my blog hop! Happy New Year to you also :) Thanks for the sweet comments! Ooooh, looks delicious! Sounds pretty easy to make, too. For some reason I had in my head that pudding was complicated! That doesn't seem the case with this recipe. Homemade pudding is the best :) thanks for the sweet comments, if you end up trying the recipe tell me how it turns out! Happy New Year to you also :) Thanks for hosting!